Not only does Ecostat Select regulate the temperature and the water quantity in the shower to suit your individual needs. It also provides an attractive, generous storage area for all kinds of shower utensils. 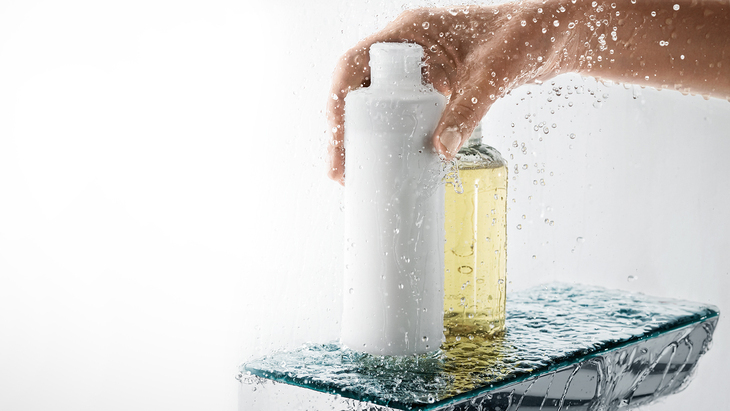 This blend of form and function makes it the new star amongst the Hansgrohe shower thermostats. Another plus: Installation flush with the wall means that the connections are elegantly concealed. Ecostat Select incorporates intuitive usability with optimum comfort and beautiful stylistic elements. Water saving function included: in the case of the individual thermostat, the water quantity is limited to 10 l/min. If more water is required: just release the limiter button and turn it further. It's not just the Ecostat Select thermostat. It's not just the Raindance Select overhead shower. It's not just the Raindance Select hand shower. It's not just the Ecostat Select thermostat. The Raindance Select Showerpipe offers the perfect combination of all three elements and guarantees the perfect pleasurable shower experience.